Many people are looking for a purpose in life, particularly when they retire and the years start to mount up. Bob has amassed a wealth of knowledge about a particular aspect of gardening, and considers it his purpose to freely give away that knowledge so it is not lost. When Henry thought about it, that is a philosophy that could apply to any aspect of life. Bob retired early owning an eight acre block of land, but his inclination was to gradually develop a garden. So that is what he did. Over the following decade turned the existing orchard into an award winning garden recognised worldwide. His garden named Katandra, won the ‘Garden Of The Year Award’ and was featured in prestigious books and magazines worldwide. Later he decided to downsize and purchased a home on a one acre lot in the south east suburbs of Melbourne. And there he has done it again. He has developed a second brilliant garden of native Australian plants, commencing when he was over seventy years. He may be the only person who has had two separate gardens be part of the ‘Open Garden Scheme’. In this broad ranging discussion we talk about his philosophy of how to plan and develop a garden that suits the plants as well as the gardener. It is a different way of looking at the whole concept, and one that makes perfect sense. The proof is his present garden which looks mature, and is lush and thriving although it has been planted over the last four or five years. Bob’s particular interest is the Australian native plant called a ‘Correa’ which has dozens of variations and in which he finds endless interest. If all this sounds a bit ‘out of your league’ we spend a lot of the interview discussing how a new gardener can develop a garden, how to select the most appropriate plants to suit the location and conditions, and a most important piece of advice … don’t rush. Bob treated me to a walk around his incredible property, pointing out individual plants and talking about the birds, lizards and frogs that add to the gardening experience. And finally, he heartily recommends gardening as a way of keeping fit and well, gainfully occupied, and a way of becoming involved with an excellent community of like minded people. Head on over to http://RockYourRetirement.com to leave a comment. Betty Anderson can tell you. That's because she's addicted to line dancing. She didn't even know how to line dance until after she retired! And now she dances 7-8 times a week! She doesn't let her age stop her and you don't have to either. This is a great activity for people who want to rock their retirement! It can be a wonderful retirement lifestyle addition. Henry was shocked when Betty told him about the similarity line dancing is to ball room dancing. You don't have to get a cowboy hat or big belt buckles to boot scoot anymore... you can come as you are. And the best part is that you don't need a partner! You can go by yourself and have just as much (if not more) fun! Often Henry starts an interview with a purpose, then the discussion leads to things far more important in the grand scheme of life. Ian is an ex builder and carrier who became a model train enthusiast when he retired. He has built a number of train layouts, but interestingly for him it isn’t operating the trains that attracts him, it is another aspect altogether. The layouts he has built are for different gauges, or sizes of model train. Henry quickly learns that a layout can vary from the size of a pillow to taking up your whole back garden. They talk about how people start the hobby, how much it costs, and where to find all sorts of information. The internet is hugely important in getting materials, models, scenery and the historical background of railroads and individual trains. Ian also purchases the scenery and plans for his models from the Australian Post Office. He also uses an internet company called Scale Scene, which has a plethora of product! Ian and his wife Anne retired and downsized to a 55 and older community. downsized when they retired and elected to live in an over fifty-five’s community. This was huge in their lives, and they are very happy. A 55 and older community can help you with that. It warmed Henry's heart to walk into this room to find a bunch of women enjoying each other's company while sewing and laughing. Or...Maybe he was having a flashback to some tribal memory of times past. Dorothy is one of the investigators of the Berwick branch of the Australian Sewing Guild. The Guild, which has branches throughout Australia, was created to promote the art and craft of sewing. But Henry thinks that it is achieving much more. Henry and Dorothy discuss the importance of sewing and how the Guild got started. They talked about how it operates, and what they sew. They have group and individual projects. Like most social groups, it also acts as a support group. They talk about the entry point for people who may want to start sewing, and really the dollars needed to buy a basic sewing machine are low enough that almost anyone can get involved. And, she tells us where you can ‘try before you buy’ to check if this really is for you before committing. Today Henry learns how to make life Fantastic! Today's guest is one of those rare people. Winston Marsh, AKA Winno, has a purpose in life. And that purpose is to help everyone he meets. Winno is professional speaker and loves helping people. Originally studied to be an aeronautical engineer, he found out that he needed to do something different. Marketing was where he wound up, and he also had a knack for motivational speaking. Winno talks about WIIFM. If you've been in sales, you probably know what that means. If not, listen to the episode to find out! Although he's past "retirement age", you'd better not use those words with him! He prefers the vibe of "lifestyle change", and that includes downsizing, and taking on less so that he can have more white space in his life. Henry and Winno talk about everything from the Americas Cup challenge, to giving up a hundred cigarettes a day and running a marathon. They talk about interesting people Winno met, and how he was able to improve their lives. And most importantly they talk about the opportunities that open up when you quit full time work and how you can move toward them. In particular Winno encourages all of us to point young people toward the ‘Rotary Youth Leadership Award’. And please remember to press share and like at the foot of the page to spread the word about how everyone can achieve an excellent retirement (lifestyle change). Contact Henry at: henry@retiredexcited.com or leave a comment below! Mark's friend bought a tandem bike when they were teenagers, and two lives changed. Now Mark has been to over seventy countries. If that's not Rocking his Retirement, I'm not sure what is. Henry and Mark talk about what its like to bicycle as you get older, the types of bikes, and what to do in order to get into shape after years of inactivity. Australia has many dedicated bicycle lanes (tracks) through gorgeous country. You don't have to ride your bike in the city. You can get out of the city and into the country with your bicycle. Staying in shape helps with the physical, but commuting with nature helps with the soul. Mark has a very definite attitude to living life with a ‘purpose’. He and Henry come back to that many times in them show. Contact Mark at the store if you have any questions about cycling or the cycling world. In this episode, Henry talks with Dorothy Nicol about her vintage dresses and gowns. Dorothy is 87 years old. She has lived her entire life in the small town of Lismore which is located in Victoria Australia. She absolutely loves her hometown and she wanted to do something to help the town and the community when she retired. Dorothy has an amazing collection which includes thousands of 20th-century vintage dresses and gowns. She began collection many years ago and the collection grew so much, she needed more space! Henry and Dorothy talk about how she purchased a property she had cherished since she was a young girl, and turned it into a small tourist attraction. Sometimes Dorothy feels like she is unorganized because she has so many items! She admits she isn't like a boutique shop, she prefers the quaint, charming feeling of her store. She likes for people to come into her shop and be able to look around and touch the items. Touching most often is not allowed with vintage garments. Henry interviews Di Lockwood on her passion for art. Before retiring at the age of 54, Di was a teacher for about 37 years. She always has a strong love for art and she knew once she retired she was going to pursue her passion for art. She even planned and prepared for it before she retired by studying and taking courses. When she did retire, she took up visual arts and decided she like printmaking the most. Di created an art gallery in her home. It is a not for profit gallery and she only charged a small amount just to help pay for the insurance she has to have. Di doesn't do what she does for the money (she doesn't really make money) she truly loves what she does and has a true passion for art. Henry interviews Di and Ross Lawrence who run a business selling deer antler velvet in their retirement. Before Di and Ross retired, they ran a deer farm. Di worked part-time as a bookkeeper and Ross ran the farm. As they got older, they knew they would have to leave their farm as it became too much work for them to maintain. Ross even got pretty seriously injured. In 2014, they decided it was time to sell. Henry talks with them about the transition from farm life to life in the suburbs. It was an easy transition for them. They bought their home before they sold their farm. Ross and Di downsized their belongings. They were prepared for it. It was, however, difficult for Ross to leaving the animals he had taken care of for so long. Ross knew he wanted to stay in touch with the deer industry after he retired. He already had a small online business selling deer antler velvet products and he decided he would continue that business in his retirement. In this episode, Henry interviews me and we talk about how money isn't everything. I actually was hesitant to release this episode since it seems a little self-serving, but my "deal" with Henry was to release his episodes one at a time so that they would live on in the Rock Your Retirement feed. Tim Stansmore went from cats to classic cars in his retirement. Tim built a successful "Cattery" during his working career. What is a "Cattery"? Good question because I didn't know either until I listened to this interview. A Cattery is a boarding establishment for cats. Tim didn't just build any cat boarding facility, this was the Taj Maj Hal for cats. Ironically, Tim is allergic to cats. Tim and Henry talk about some of the hilarious stories of the owners of the cats. Tim says in the interview, if he was to write a book, it would be on the cat's owners and not the cats themselves. So how does Tim go from cats to classic cars? After 10 years, Tim sold his business and bought a property on the east side of Melbourne Australia. The property came with a garage, a huge shed, and an aircraft hangar. This would end up being perfect for him to store his many classic cars and motorcycles. This guy knows his stuff when it comes to cars and motorcycles! Tim and Henry talk about they many cars and bikes he has collected including a 1926 Model T Ford, 1930 Model A Ford, 1971 Lancia Fulvia and many more. Tim likes to buy cars, restore them and then trade or sell them for a small profit. Unless he gets attached to a car and cannot bear to part with it once it is finished. However, for Tim, it's not really about the money. It's about saving the cars. Old cars and motorcycles are Tim's passion. It is a lot of work but as Tim says "if you enjoy what you are doing, it's not really a job". Tim tells a story of a car he bought and sold the same day. He owned the car for a total of 15 minutes and made a decent profit from it. So what's next for Tim? He is going to sell off his fleet and buy more of course! His real passion is old English Motorcycles and that is what he plans on focusing on in the future. Do you have a story about cars or bikes? Do you have a story about cats? Leave me a comment in the Reply box below. Peter Glover was learning to fly when he was 60 years old! Some people retire once, Peter Glover did it twice. The first was a planned retirement and an injury caused the second. This wasn't necessarily a bad thing though! With time on his hands, Peter was able to pursue his passion of learning to fly. Secrets about Retirement Your Broker won't tell you. Get your FREE report NOW! Before Peter retired, he raced cars and motorcycles. His mechanical experience allowed him to build "rally cars". Peter won a som major races in Australia. Once he retired from this work, he bought a large sheep and crop farm. With basically no experience, Peter managed his farm successfully until he was injured and hurt his back. This stopped his farming career. Peter didn't have the opportunity to become a pilot as a teenager. But it was still in his heart to learn. And after he spoke with a pilot at a car race one day, he decided he was going to fulfill his dream of learning to fly. Think it's expensive? Learning to fly might not be as expensive as you think. But not everyone can do it because you would spend about as much for a good light plane as a mid priced luxury car. Insurance, servicing & maintenance, gas for the airplane and lots more! There is a lot of information on the internet about flying. And you can subscribe to magazines on the subject as well. Check out your local airports as they often have flying schools. Here in California some of the Community Colleges offer it as well. If you have any experience in flying leave a comment in the box below. In this episode, Henry interviews Margaret Cook, a serial entrepreneur, about making the most out of life. Margaret started her married live in an RV! And she's not afraid of learning either. Her zest for it gave her the opportunity to learn what she needed to know in order to build a coffee shop in her home town. This is a fascinating story of someone not afraid to follow her own path, and not afraid to put in the time to learn. Henry learned how Margaret is making the most out of her current life. Margaret did a lot of things. She worked as a nurse when she was young. This woman even taught herself how to upholster furniture. She purchased and ran a shop to showcase her furniture. And she's been a hairdresser. Not only that, but she's also been a massage therapist. This woman has done it all! In her current life of setting up and running the coffee shop she's had to learn a host of new things. This includes the legal aspects in her area. It includes deciding on what to add to the menu. Additionally, she needed to figure out her niche, or what type of clients she wanted. And...what about the competition? The cool thing is that she created this "room within a room". The shop is called "Antiques and Coffee" and is located in Lismore, Australia. Margaret has a list of ongoing projects including her "Stage Two" which will be taking an extra lot that is next to her family's farm into another eating place. You can learn all about it by listening to the episode. Just click the play button and you can listen now. Margaret received inspiration the book ’The Life You Are Born To Live’ by Dan Millman. She really liked the advice in the book to "make good of bad" and that's what she did. Margaret's motto: Make the most out of it. We only live once. You should go out and seize the day. Henry went on vacation to a Carob factory! He visited a tourist attraction called Carobana, and discovered that one of the owners, Jean Hamey, had a lot more to talk about than just carob! She and her husband Ian operate Carobana, which is a tourist attraction, and a factory, which manufactured Carob coated treats. 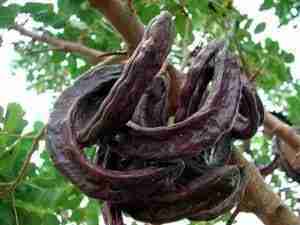 If you have never seen carob, it is a large seed pod of the carob tree. We actually have them in San Diego where I (Kathe) live. First you remove the seeds. Then you dry and powder the pod. Jean explains the rest of the process in the interview. Jean agreed to talk about her carob organization with Henry. She and her husband inherited the place after her in-laws passed away. They now have a successful manufacturing, retail and tourism business. Much of the interview focuses on the development of the enterprise, and Jean’s unique business skills. As far as the carob business, Ian has built much of the machinery, and persistence and hard work have produced a steady growth which has resulted in the success Carabana is today. The pod not only contains many small beans, but also a semi-sweet pulp. These pods contain iron, magnesium, calcium, along with vitamins A, B2, B3, and D.
Carob pods are used as a cocoa substitute for chocolate flavoring. It doesn't taste like exactly like chocolate but it does work as a substitute. On a diet? Carob contain just 1/3rd of the calories of chocolate. Even if you are allergic to chocolate, you can usually eat Carob. Henry asked Jean what she was going to do after her imminent retirement. And boy does she have plans! Not only has she been running a business all these years, but she also does book-binding, writes children's books, AND writes craft books as well. So she has a lot going on. Have you ever heard of "Quilling"? I, Kathe, had never heard of this before, but Jean has written a book on it Quilling Beauties of the Bush. You may have heard of it, but it's basically a way to make beautiful 3D pictures out of paper. Basically, you use strips of paper and then roll or shape them, and glue them together. Then you loop, curl, and twist the paper until it makes something beautiful. 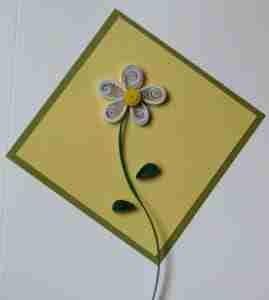 Quilling creates greeting cards, jewelry, or pretty much anything that you want to make in a 3D manner. I (Kathe) found the quilling part of the interview to be fascinating. It was fun to learn a little about a hobby that I'd never heard of. Of course once I looked it up, I realized that I had seen the finished works of these artists. If you are in Australia you can purchase Jean's tasty treats at http://www.carobana.com.au/. And you can purchase her quilling books anywhere in the world on Amazon. Have you ever done quilling or eaten carob? Let us know what you think in the comments below. Henry had never gone to Karaoke before. "I admit, I had a jaundiced idea of karaoke although I had never been to a session. But three hours in the Royal Hotel in Taree has turned me round completely. However, I promise never to get up to sing, simply for the protection and respect for the other patrons. Why SWMBO and I attended a karaoke night is a bit of a long story, so you will have to listen to find out. We both loved the Thursday night karaoke in the Royal Hotel in Taree, where I learned many things and was forced all my preconceptions about karaoke. And you can't beat the five dollar Bangers and Mash meal for value. Jim Moir doesn't think that he's too old to skydive. Henry had a conversation with Jim and found out that Jim used to skydive competitively. When he retired he said he was obviously too old for competition because the youngsters thrash him. Jim couldn't just retire from skydiving though, so he redirected the skills and experience he had built up over decades. Rod and Tina Holt wanted to explore Australia after working hard physical labor all their lives. They decided on a life on the road in a RV, known as a caravan in Australia. Now they are RVing across Australia. Rod, being very independent loves the freedom of the wide open road, not to mention the absence of stress! How do you start to live the RV life? Why are life stories important? There are things in the world that most folks just don’t think about. Maybe till it is too late. Janella Hodgson records the life stories of people as they approach the end of their life. Maybe they are terminally ill, or maybe they are simply aged and worn out. She is a volunteer for Eastern Palliative Care, which is an organization that provides Palliative and Hospice services. These include home and nursing care to recording and transcribing the stories of people who have moved beyond medical help. Read more at Rock Your Retirement. Retired twice, because of boredom, she knew she had to have something to keep her busy. Her second retirement was planned so that her husband would retire, but that's not happened as of the recording of the episode! She indicated that retirement lifestyle includes activities to keep your mind alert and to keep physical. Start ticking things off your bucket list. One of those was to learn to ride a motorcycle later in life.